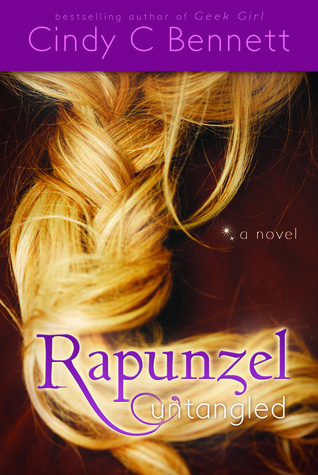 How Received : ARC courtesy of NetGalley on behalf of Cedar Fort, Inc.
Rapunzel is seventeen years old but she is far from average. For one, she has never been outside her apartment due to her disease which could kill her if she comes in contact with germs. Second, she has golden hair fifteen feet long. She lives in a mansion and sees her mother twice a day. When her mother gets a computer for her to complete her homework, she never dreams that it would change her life completely. Rapunzel has just discovered this wondrous thing called Facebook…..where she “friends” Fane. Soon they start chatting and Rapunzel can’t stop thinking about him. Then she starts wondering what it would be like to meet him. That’s when things get complicated. As you can probably tell from the summary, this is a modern retelling of Rapunzel. When I first read the description of the book, I was intrigued by her using Facebook as a means of the “princess” escaping her tower. I thought it was a really clever way to retell this fairy tale. The plot moves along at a quick pace and there is a LOT of romance. Talking between Fane and Rapunzel, cute little conversations, many of which have to do with Rapunzel knowing nothing about the outside world and Fane finding this adorable. The ending was also interesting and satisfying and I liked the turn she took with why Mother Gothel took Rapunzel and kept her in a tower. My biggest problem with this book though was Rapunzel herself. For a modern retelling, I was hoping for a more modern take on the feminine character. Rapunzel is mostly just kind of fragile and full of naivete, totally unable to help herself in most situations. She basically constantly relies on Fane to come and rescue her. Everybody needs help once in a while but come on sister friend! Use your brain and help yourself out once in a while. Also, I had kind of a big issue with the whole meet a guy on Facebook, invite him over and fall in love thing…as far as I know friending some random person on Facebook is NOT the best way of finding true love – (trust me – watch Catfish if you don’t believe me!). Also possibly not the best message for young girls out there – “don’t trust your parents, trust that boy you met online.” I enjoyed the book overall but I had some big issues with the underlying message. I give it six shoes – I liked it but I think it could’ve been better.